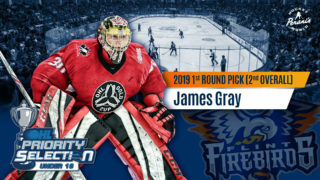 Flint, Mich. – Great family fun promotions are scheduled for this weekend as the Flint Firebirds return home to the Dort Federal Credit Union Event Center for a pair of games this Saturday, Dec. 1 at 7 p.m. (ET) and Sunday Dec. 2 at 2 p.m.
Saturday, the Firebirds host the Erie Otters for the club’s fourth-annual ‘Teddy Bear Toss’ Night. Fans are encouraged to bring new or gently used teddy bears or stuffed animals to the game and after the Firebirds score their first goal, fans can launch them onto the ice. The stuffed animals will be collected and donated to the various local charities throughout Flint & Genesee County. Last year, the Firebirds donated more than 1,000 stuffed animals to the local charities. Fans are asked to bring and throw their stuffed animals in bags so that they stay dry and safe for the kids. Blue Line Club Menu: Presented by Great Lakes Sandwich Co & Cafe, Saturday evening’s dinner menu for the Blue Line Club features fried chicken, spaghetti with meat sauce, Italian meatballs, macaroni and cheese, mashed potatoes with gravy, green beans, garden salad and assorted desserts. The menu is available to all sponsors and season ticket holders for $18 per person for an all-you-can-eat buffet, $12 for one trip. Dinner RSVP’s are encouraged by emailing Karla Turner at karla@flintfirebirds.com. 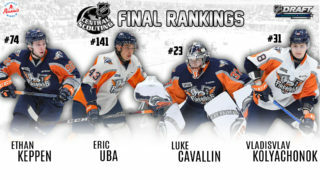 The Flint Firebirds are a proud member of the prestigious 20-team Ontario Hockey League. The OHL is part of the Canadian Hockey League (CHL), which is known as the world’s premiere player development league for the NHL. On NHL opening day rosters in October, 70% of the players were CHL alums. Since the Firebirds inception three seasons ago, the team has produced 15 NHL signed or drafted players. 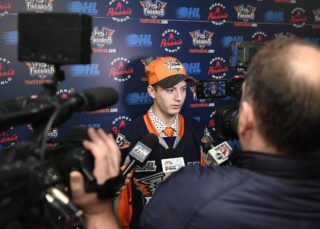 The Firebirds average nearly 3,000 fans per game at the newly renovated Dort Federal Credit Union Event Center, reaching over 100,000 fans each OHL season.